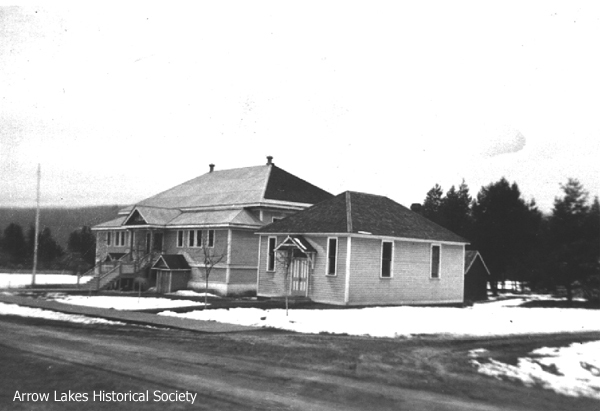 In 1893, the first school in Nakusp was built where the Overwaitea is today at a cost of $275. Miss Caldwell, who came out from Ontario, was the first teacher. A teacher’s salary at this time was $60 per month and an amount of $40 per year was allowed for incidental expenses. The school opened with nine pupils. As with most school buildings, it was also used for an inexpensive meeting hall. Fittingly, the first concert given in Nakusp took place in the school and proceeds were applied to the school building debt. The following year, the school board trustees received a report in February from the BC Government that $1000 would be allotted for the purpose of building a new school. Once this larger structure was built, complete with blackboards, and desks, the former building would be available for civic use or a church. This building actually became the first Anglican Church. The school board petitioned for four free lots from the townsite company for the location of the school and grounds. Agreement was finally reached when two lots were donated to the town. The process of clearing the land and construction of the school met with so many delays that the young people had to wait until the new year for their new building. Called the ‘Little Red School House’ because of its colours, the school had a combined cloakroom-entrance, and was built to accommodate about thirty pupils. The building was located where the School Board office sits now. A general grant of $40 per year was given to the trustees by the BC Government to help with heating and supplies. The Government also paid the teacher’s salary but all extras had to be paid by the local population. Money was raised through donations and subscriptions, but also through extravagant dances where guests came from adjacent towns. This little corner school provided the town’s only place of learning until 1911 when a larger, two-room building would be built to accommodate the burgeoning young population. The Little Red School House was bursting at the seams with more than fifty students. Teachers came and went because it was increasingly difficult to control the pupils in such crowded conditions. Fortunately, a new school district was formed in Glenbank in 1910 and a first-class building on Lot 6 in the Edwards subdivision was built on the site (where Willi Jahnke’s house currently sits, 2013). In June 1911 and February 1912, payments were made by the school board for CPR lots 11 and 12 for a playground area, and on lots 13 and 14, Block 11, the school now called the Centennial Building was built. It was started in 1911 and completed in 1912 with classes starting in the fall. About forty-five students were enrolled under the direction of Principal Gordon and teacher Kathleen Mitchell. The school provided classes for pupils up to Grade 8. Those who wished to go to high school had to go to Revelstoke, Nelson or Kaslo. The school was equipped with single hinged-seat desks and large blackboards. Inside steps led down to a hall in the basement, which separated girl’s and boy’s areas for washrooms and play space in times of inclement weather. A year later, local teacher Miriam Chandler was hired and stayed until 1919 when she moved with her family to Victoria. They had lived in Glenbank at the Grigg/Chandler ranch. Principal R.C. Warden, who came in the fall of 917, was asked to start teaching first year high school classes in the fall of 1917. Families outside of the town boundary wishing to take advantage of this program were asked to pay a fee because they paid no taxes towards the town schools. 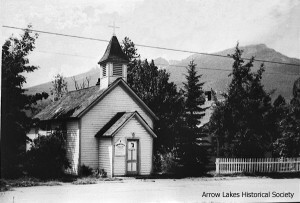 In 1919, the Little Red School House was reopened and Principal T.J. Barron, who had arrived the year before, taught high school in this building. In 1921, the first matriculation class passed pupils Mary Kirk, Ed Anthony and Inez Carlson. Because of the need for expansion, another small school was erected behind the Little Red School House, located behind the present school board office. This gave Nakusp four rooms for pupils and staff was increased. Usually after marriage, school teachers were not allowed to work, however an exception was made for Kathleen Mitchell, who came back in 1921. Kathleen Berry, as she was now known was a good teacher and no husband arrived with her, giving the impression that she might have been separated from him. She became Vice Principal and two other teachers, Olive Rooke and Lillian Hunter, were hired to complete teaching requirements for those four rooms. Because of amalgamation in 1945, high school students had to hike to Glenbank to attend school in the old building that was built in 1910. Glenbank and Brouse students were then bussed to Nakusp for school. The old Parish Hall was also in use for some classes, where the BC Liquor Store is currently located (2013). What about the new schools? Check this out.